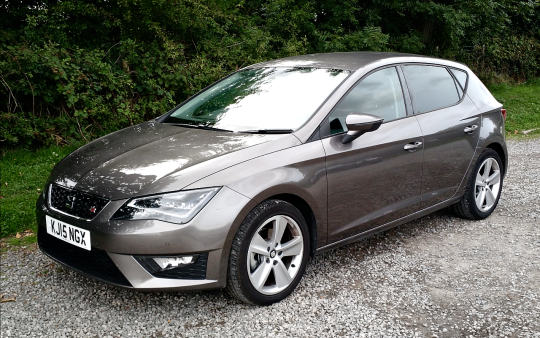 The first car I reviewed on this blog was the SEAT Leon SE, and I thought it was a brilliant car. But it turns out a brilliant car can be made even better. Enter the Leon FR. Let’s begin where the majority of improvements are concentrated on the FR: the suspension. SEAT’s FR package is designed to improve the Leon’s handling, stiffening everything up so that the car handles more sharply, basically ensuring it is more fun to drive on twisty roads. On the previous generation Leon, the FR trim was deemed too stiff by many, generating a rough and unpleasant ride. That is not at all the case on the new FR – the handling is dialed in just right. Drivers will notice an ever-so-slightly choppier ride on the motorway in comparison to the SE, but it is nowhere near uncomfortable. Quite the opposite, in fact. It feels poised and balanced, and a few hours on the motorway are pleasant and relaxing. But even though it could happily do it all day, you don’t buy a Leon FR for motorway cruising, of course. It’s when you throw it into a corner on a winding rural road that the Leon FR absolutely comes alive. To begin with, the weight of the steering and the feedback that comes through the wheel are excellent, such that you feel entirely in control of the car. It is so responsive and easy to point the car exactly where you want it to go. It takes corners beautifully, with little discernible body roll, and feels thoroughly planted from entry to exit. Even on rough surfaces, the car handles so precisely that you don’t question its ability to go where it’s supposed to. I have rarely driven a car that so noticeably enjoys being driven through corners quickly, and that inspires complete driver confidence. SEAT has clearly designed the Leon FR to be a driver’s car, and they’ve simply nailed it. This particular Leon came with Volkswagen’s 2.0L TDI, making 148bhp and 236lb.-ft (which will now undoubtedly be scrutinized following #dieselgate). This is the first opportunity I’ve had to drive the 2.0L, even though I’ve generally recommended it over the 1.6L TDI for its power gains. In many ways, it doesn’t disappoint. It retains the smooth and efficient character of the TDI engines, and the increase in power is certainly welcome. Whilst not a fast car, it feels pretty quick, and the power band is well-situated for the kind of spirited driving you want to do in this car. Perhaps because it is quicker, however, you will notice more turbo lag with the 2.0L, particularly when it comes to rolling starts in second gear. Typical of diesels, it also runs out of steam over 3500rpm, which puts a slight damper on the fun. I would like to try the Leon FR with one of the bigger TSI engines, perhaps the 1.8L. The engine sends power to the wheels through a 6-speed gearbox, which has nice throws and good ratios that work well with the engine’s power band. I had a slight problem with this particular gear lever, though: Like all Volkswagen products, you have to push the lever down to shift into reverse, but the spring controlling that function on this lever felt quite loose. As a result, a few times when I grabbed the lever to shift particularly from first to second, the pressure from my hand would inadvertently push it down and end up sort of directing it into fourth gear. It’s a bit hard to explain, but basically, you need quite a light touch to shift into the gear you wanted. Again, this may have just been an issue with this particular car, but it happened frequently enough to be a little annoying. I maintain what I said previously about the Leon’s interior. It is comfortable and quiet, and the driving position is excellent. There is a good amount of room everywhere. It is clearly not of the same quality as the Golf – materials feel a bit cheaper all around – but it certainly looks better. Everything about the Leon tells you this is a sporty car, from the red stitching to the leather-wrapped and well-designed steering wheel to the fantastically-readable and well-positioned gauges. In many ways, the Leon’s interior is a lesson in ergonomics too; with the exception of a relatively small and laggy infotainment screen, the controls are simple and straightforward, and laid out logically, again emphasising the fact that this is first and foremost a driver’s car. Finally, I maintain that the Leon is just a great looking car. The sharp angles and hunkered down stance give it an aggressive and somewhat intimidating persona, particularly from the front. I always like cars that look like they have a bit of attitude, especially when they’ve got the character to back it up, as the Leon does. Last time I concluded that the Leon was a brilliant car, and that I would probably prefer it over the Golf. 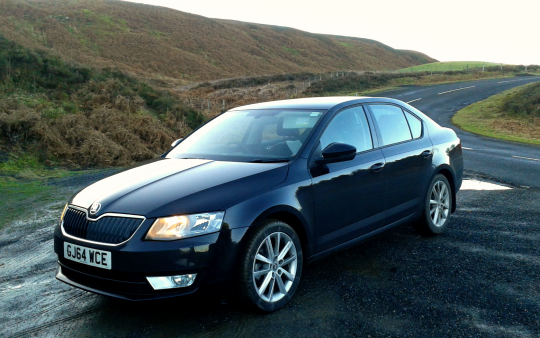 In FR trim, the Leon turns brilliant up to 11, and I do not hesitate to say it is better than the Golf. In fact, as far as reasonably priced cars go, the Leon FR is, very simply, the best car I have ever driven. Engine: 2.0L TDI I4, 148bhp, 236lb.-ft.
Attuned as I am here to the needs of the consumer, I presume that you will, no doubt, be required to hire a van at some point, as I was recently. As a result, you’ll want to know what kind of options are available to you. 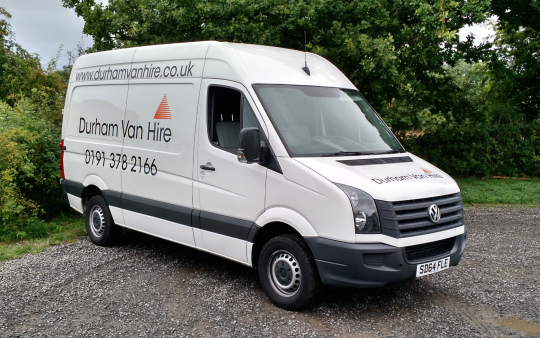 This is the third time I’ve hired a van, but my first experience with the Volkswagen Crafter (both previous van hires have been short-wheelbase Ford Transits). In my experience, most van fleets are full of Transits, which means you will probably end up driving one of those. But if you get a Crafter, here is what you can expect. No van is going to drive well, nor are they particularly designed to. Vans are designed for utility, not driving experience. Still, a few comments on how the Crafter drives are in order. In the first place, it feels more rugged than the Transit. In part, that’s because the Crafter is overall a heavier-duty van, this particular model having a GVW of 3.5 tonnes. Being a heavy-duty vehicle means it comes with the attendant features of a rough ride and lots of noise, but it also means it comes with the sensation that this van is really up to the job of lugging around a lot of stuff. I only had to move a small flat’s worth of furniture, but I could hardly notice the extra weight at all. All that being said, the Crafter manages to feel quite a bit more refined than the Transit overall. This particular van came with the least powerful of the Crafter’s range of 2.0L TDI engines, rated at 108bhp and 221lb.-ft. The numbers don’t sound big, but the engine feels up to the job, especially as panel vans are fairly light weight when empty. By no means is it fast, but given the way it is geared, it uses the power it has well. First gear has an especially low ratio which helps it get off the line quickly, although the gap between first and second is a bit too much to make second-gear standing starts a possibility. You can do it if the van is empty, but you feel the engine protesting a bit. Altogether, though, ratios are well-spaced and sixth gear places the engine perfectly in the middle of the power band for easy motorway cruising. Gear changes aren’t slick, but I like the real mechanical feel and sound they make. The clutch takes some getting used to, as it has both a heavier feel than your average car, and engages very quickly after beginning to release the pedal. And when it does, it grabs the flywheel quite hard, making it easy to stall if you’re not prepared. As with any big high-sided vehicle, the Crafter does not like crosswinds on the motorway, and with a fairly high steering ratio, this means you’ll be using your hands quite a bit to keep the van going in a straight line. Inside, the Crafter is very basic. It has the gauges you need, a radio, and a few climate controls. The three seats in the cab will accommodate big people, and though I could have done with the driver’s seat reclining just a bit further, my 6’4” person had no problem comfortably driving the van. Controls are all within easy reach, and the only one I struggled to make sense of initially was the cruise control, in part because there is no light on the dash indicating it is on (perhaps the bulb on this particular gauge panel was burned out). Visibility in the van is excellent; the tall profile means the windscreen is huge and because you sit up so much higher, you have a commanding view of the road in front. Big mirrors on the side mean visibility around the van is good too, and the small convex mirrors on the bottom help when you need to reverse. As it was 23ºC the day I drove the van, I could have used air conditioning, as the lack of insulation means it gets warm inside the cab very quickly, and at 70mph with the windows down it is impossible to have a conversation, let alone hear yourself think (although thankfully the wind moves in such a way that it does not blast you in the side of the face). It’s also not helpful when you’re parked on the A1(M) for an hour on a warm, humid evening. But what is a van ultimately for? Storage space. And of course, in the back, there is tons of room, given the medium-length wheelbase and high roof. I could even stand upright between the support braces across the roof. I packed it loosely as I didn’t have that much stuff to move, but packed well, you could fit a lot of cargo in this van. I have always enjoyed driving big vehicles, and driving the Crafter was no different. Though I would not want to do it every day, I have to acknowledge that I occasionally enjoy indulging the sense of power and responsibility that comes with driving a vehicle like this. And in the end, although I only have the Transit to compare it to (and not even the latest version of it), I would pick the Crafter. It feels more solid and refined overall, and again, whilst utility is your primary concern in a van, why not opt for the best packaging of that utility you can get? Engine: 2.0L TDI I4, 108bhp, 221lb.-ft. The Ford Focus has been one of the best-selling cars in Europe for a long time (and indeed, was the best selling car in the world in 2012 and 2013), and with good reason. It is a good all-around package: stylish, reliable, well-built, and fun to drive. I have driven two variants of the Focus previously, one with a 1.6L diesel, and one with Ford’s sweet little 1.0L EcoBoost engine. Though I found the diesel sluggish, I liked the EcoBoost. 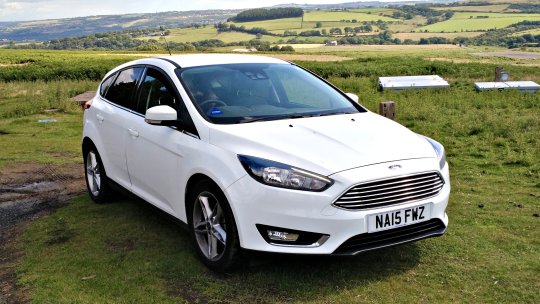 Ford has just given the Focus a facelift, and with some other minor tweaks, it was good to have the opportunity to drive it again. I think Ford did a good job with the refresh, incorporating the bolder and more open grille that is becoming characteristic of Fords, without altering its overall good looks too much. Inside, not much has changed either, with the exception of a big touchscreen infotainment unit taking the place of the small digital display that used to reside above a myriad of buttons. Thankfully, many of those buttons have gone as their functions now reside within the touchscreen unit. It looks much simpler overall, and is more intuitive, resulting in a better user experience. The cabin still feels a but busy, and the somewhat edgy design will go out of date very quickly, but it’s not a bad place to spend some time. As you would expect, you are treated to Ford’s generally good build quality inside. The materials feel pretty nice all around, and even when riding over poorly surfaced Northumbrian B-roads, no squeaks and rattles are audible. The Focus has a comfortable driving position, with more than enough legroom for someone of my height. Indeed, it could accommodate someone much taller – use the lever to put the seat down, and you wonder if it’s going to stop before it hits the road surface. I needed to keep it up a bit to be able to see properly. Interior room is good, including in the rear seat, and there is a good-sized boot as well. Steering wheel, gear lever, pedals, are well-placed, as are the simple, legible gauges, and you quickly feel relaxed and in control behind the wheel. For whatever reason, I noticed that compared to the Golf, the Focus feels quite big when you’re behind the wheel, and while it didn’t bother me, other drivers may not like that as much. From what I have read, different automotive journalists hold different opinions on whether the Focus or the Golf is the best driver’s car in this segment. I like the Golf a lot, but the Focus is certainly a pleasure to drive. It does so many things right: it’s balanced and composed on the road, it remains firm and poised though the corners, the steering is precise and well-weighted, the brakes good, the overall feel solid. This is one of those cars that can settle down and cruise comfortably on the motorway one minute, and happily dart around twisty B-roads the next, almost inviting you to throw it into corners. When it comes down to it, I think I would still give the edge to the Golf in terms of pure driving experience, but I would not at all be unhappy driving the Focus day to day. Ford’s EcoBoost engines get great reviews all over the place, and for good reason. They are smooth and very fuel efficient, and for their size, quite powerful. The 1.0L EcoBoost engine in this Focus makes 125bhp and 148lb.-ft., and whilst I like the engine a lot, in this particular car, it feels like it could use some tweaks to make the driving experience a little better. Under normal driving, for instance, the engine feels a bit sluggish and underpowered. Perhaps it has to do with the ratios of the six-speed gearbox, or the final-drive ratio, but it’s only once you get up into the middle of the rev range that the engine starts to come alive. In fact, I gave it a full-throttle blast at one point just to see what it could do, and simply could not believe how quickly it hit 60mph. You would never guess that an engine that feels a bit lazy in normal conditions was capable of accelerating like that. Oddly, I don’t recall the last EcoBoost Focus I drove feeling like that; perhaps they’ve changed gearboxes with the refreshed model, or maybe different trim levels come with different final drive ratios. The six-speed gearbox is an absolute delight to use, owing to a weighty, mechanical feel as you change gears, satisfyingly clicking into place with every shift. Lots of manufacturers could learn from Ford here. Having mentioned the ratios above, though, it is worth noting again that they could be better, particularly in the higher gears. Although the dashboard computer will tell you to shift into sixth around 50mph, you would only ever do that if you’re on a flat surface, and even then, you certainly won’t be passing anyone without a downshift or two. The clutch also takes some getting used to (I remember this from the last Focus I drove), as it engages very quickly. As you ease out the pedal to the biting point, you expect it to engage gradually like most other cars, but suddenly find yourself lurching forward. As a result, it’s a bit tricky to hold the car with the clutch, and by the time I returned the car, I still hadn’t managed a perfect 1-2 shift. These are minor points, however, and overall, the Focus remains an excellent all-around package. Were I to buy one, I would opt for a more powerful engine, such as the 1.5L EcoBoost. But on the whole, I wouldn’t hesitate for a moment recommending the car, and will look forward to the next opportunity I have to drive one. Engine: 1.0L EcoBoost, 125bhp, 148lb.-ft. I have said before that I think the 7th-generation Volkswagen Golf is one of the best cars currently on the market, and certainly the best in its segment. 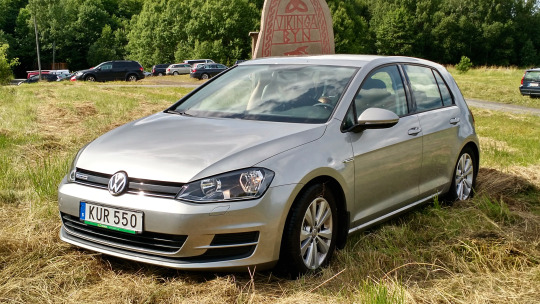 On a recent trip to Sweden, I was able to drive the Golf again, and although it is not my standard practice to review cars I have already driven a second time, this particular Golf had some of the upgrades I thought the Golf needed, and so it seemed like a good opportunity for an updated review. By way of initial comment, let me just say that there is not much to add to what I’ve said before about the Golf’s build quality. It continues to be superb, even a benchmark. This particular Golf featured a few upgrades inside, including a lovely leather-wrapped steering wheel and dual-zone climate control, as well as a nice infotainment unit with digital radio. The cabin continues to be a very pleasant place to spend time, being both quiet and comfortable. It remains, as you would expect from Volkswagen, a solid, well-engineered car. Moving on to the improvements with this particular Golf: Whenever I’ve driven the Golf previously, it has always been in the base model ’S’ trim, with the standard 1.6L TDI engine and 5-speed gearbox. After driving those Golfs, I have always been left thinking that the Golf needed two small improvements to make it better. The first is a 6-speed gearbox, to maximise the engine’s power curve, and the second, bigger wheels and tyres to firm up the ride a little. Arriving in Stockholm, I was handed the keys to the Golf you see above, in ‘BlueMotion’ trim, which has exactly those two features (amongst others). So do they help improve the driving experience of the Golf? Let’s start with the ride and handling. On that front, these bigger wheels and tyres certainly do the trick. Whilst I always thought the base model Golf handles well to begin with, I have also felt that it was a bit on the soft side for me. That is why I was delighted to find that this particular BlueMotion Golf did exactly what I thought needed to be done. The bigger wheels and tires really do help to make the Golf feel that much more planted. It’s slightly firmer, which makes the handling a little sharper, and helps inspire a little more confidence going into the corners. It also adds some weight, feel, and precision to the steering. And it does all of this while retaining its wonderfully smooth and quiet ride at higher cruising speeds. If you are going to buy a Golf, you will certainly want these upgrades. Can the same be said about the 6-speed gearbox? Although I was delighted to see that Volkswagen had fitted the 6-speed to the 1.6L TDI, that delight was short-lived. That is not to say the 6-speed is not an improvement over the 5-speed – it certainly is. More ratios are usually better. But it just didn’t add as much to the driving experience as I expected it to. Unfortunately, I could not find specifications for the ratios of the two gearboxes to compare them, but it feels as if 1st-3rd gear are the same ratios, while 4th and 5th have been altered slightly to make room for an extra ratio. This was disappointing, because it felt to me like 1st-3rd should have been tweaked instead; lowering the ratios of 2nd and 3rd in particular, in order to maximise the low-end torque, would have been a more welcome change. I could be wrong, of course, but if those ratios have actually been changed, it is not noticeable. Volkswagen’s BlueMotion technology is all about efficiency, though, and so I’m guessing they were only interested in what they could do to benefit fuel economy. I still think the 1.6L TDI is a great little engine, but as the gearbox was not as much an improvement as I’d hoped, I would still opt for the 2.0L TDI if I was looking for a diesel-engined Golf. That being said, the Golf is still a fantastic car, and it still drives brilliantly. As Top Gear Magazine says, ‘The best done better than ever. You don’t need no other hatchback.’ Indeed. You simply cannot go wrong with Europe’s best-selling car. And I certainly look forward to being able to drive it again. Engine: 1.6L TDI diesel, 105bhp, 184 lb.-ft. When you are reviewing a car, it is always interesting to first see what a manufacturer says about its own vehicle, and then to assess how it measures up to that claim. In the case of its multi-purpose vehicle (MPV), the Verso, Toyota says, ‘Verso is the family car where style and driving pleasure meet practicality and versatility.’ To me, that sounds quite promising, and that I should expect the Verso to deliver a lot of good things. The question before us now, of course, is whether it lives up to that claim. Every other time I’ve hired a 7-seater vehicle, it has been a Vauxhall Zafira, so being handed the keys to something different was a nice change. Not having driven or even ridden in a Verso before, I really knew nothing about it. In North America, Toyotas have a reputation for being good vehicles, something I discovered myself, having driven many of them over there. I expected to find the same thing with the Verso. As always when hiring a car, your initial impressions of the vehicle come from its appearance, seeing it sitting on the lot as you go through the paperwork. Toyota, in its strapline, says the Verso has ‘style’, and whilst it can certainly be said that it has a style, I wouldn’t go so far as to call it stylish. It’s not ugly – I kind of like the hunkered down, almost lowered look – but neither is it attractive. Some of the body panels, particularly the front and rear fascias, are too big, to the point of looking like tacked-on afterthoughts, and the clear taillights look like cheap aftermarket units you would find on eBay. Stepping into the Verso, you see evidence of Toyota’s reputation for quality. The materials, though not up to the highest standard, look and feel decent, and you slide in behind a lovely-to-hold leather-wrapped steering wheel. The seats are comfortable and supportive, and it is very quiet inside at speed, with not a squeak or rattle to be heard at all. All the controls are laid out sensibly and easy to use (next to wheel-mounted buttons, I’ve always liked Toyota’s cruise control…well, controls, the best), and the gauges, though mounted high up in the centre of dashboard, are easy to see and well-placed within the driver’s eye line. For the driver, the Verso’s cabin is rather a pleasant place to be. 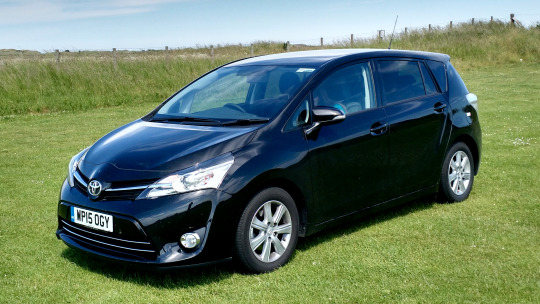 What of Toyota’s claim that the Verso can be characterised by ‘practicality and versatility’? Well, that is an interesting question. Certainly the attempts to make the Verso practical and versatile are evident. It has seven seats, most of them fold down to significantly increase storage capacity, and it has some clever storage spaces available, including some recesses built into the floor between the front and rear seats. But the Verso has one major fault that significantly hinders its practicality and versatility: lack of space. It begins in the front, where an absolutely massive dashboard eats up huge amounts of interior space, and right away requires that the front seats be placed further back, eating up huge portions of rear passenger legroom. To make my 5’6” mother comfortable behind me, I had to move the driver’s seat farther forward than I usually would, and my wife had to move the passenger’s seat nearly all the way forward to accommodate my 6′6″ father behind her. Don’t even think about trying to get an adult into the third-row seats; even my 4- and 2-year-old children found their legs crammed into the seats in front of them. What’s more, with the third-row seats up, boot space is pretty much nonexistent. If you’re going to use the Verso for four or five not-so-tall people, it might be all the practicality and versatility you need. But you will struggle if you are regularly going to be transporting more people, especially if they are anywhere above average height. Falling short in the practicality and versatility departments, can the Verso then redeem itself when it comes to ‘driving pleasure’? The short answer is, yes and no. Obviously, a MPV is never going to be the pinnacle of driving experiences, but for what it is, the Verso is not bad to drive. As I mentioned above, it is nice and quiet on the road, and motorway cruising, as you’d expect from such a vehicle, is a comfortable and relaxing experience. It would be easy to do long journeys in this car. The overall ride strikes a good balance between being firm and smooth, and for a bigger vehicle, it corners well, owing in part to a good suspension set-up and a lower centre of gravity. And although the steering is a bit numb, it’s weighted well. The brakes feel as you would expect them to on a bigger, heavier vehicle, and while they get the job done, a bit more firmness in the pedal would be welcome. I found the clutch on the Verso to take a bit of getting used to; it’s got a fair bit of play before it engages, and when it does, it grabs very quickly. The 6-speed gearbox is very nice to use, though. It has quick, short throws, and one of those satisfying clicks every time you slot it into gear, as if the gearbox is saying, ‘Yes, you got it’. Unfortunately, that nice gearbox is connected to a disappointing engine. This particular Verso was equipped with Toyota’s 1.6L diesel, making 110bhp and 200lb.-ft., an engine designed for fuel economy more than anything else. Whilst I didn’t calculate it, you’ll see figures of 60-65mpg being cited for it online. If all you’re concerned about is fuel economy, that’s one thing. But given that Toyota expects the Verso to deliver ‘driving pleasure’, the 1.6D is a big let-down in many other ways. For a vehicle of this size, it is too underpowered; moderate inclines, even with no one else in the car, usually require downshifting. Add five or six people to the car, and you will really feel it struggle. Higher revs aren’t of much use either as it runs out of steam very quickly, and will protest quite loudly when you climb over 3000rpm. Is the Verso then, as Toyota claims, ‘the family car where style and driving pleasure meet practicality and versatility’? Though it certainly attempts to be those things, it does none of them particularly well. If Toyota wants to make good on the Verso’s claims, the biggest improvements they could make would be to enlarge it and make better use of the interior space, and to equip it with a more powerful and refined engine. Were they to do that, this would be a competitive MPV. As it is, there are better options out there. Engine: 1.6L diesel, 110bhp, 200lb.-ft. When hiring a car, I usually opt for something in the ‘large compact’ class, and although that is a class of car that includes the Golf, Astra, and Focus, my local Enterprise branch seems to have turned this into the class of the crossovers. 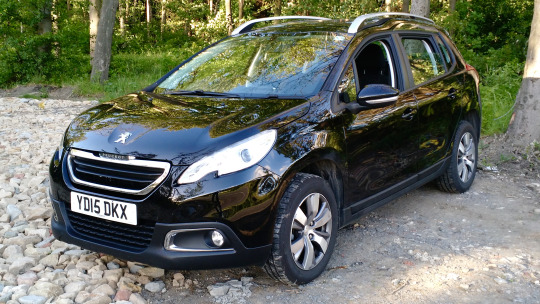 When I arrived to pick up my hire car the other day, the car park was full of Capturs, ix35s, and this, a Peugeot 2008. Either Enterprise knows that crossovers are a type of car that people love, or they are out to get me. grille of recent years, and this one even has some nice subtle curves. 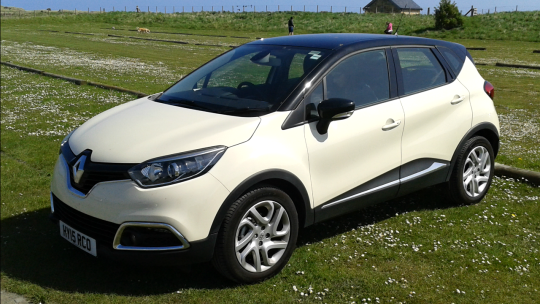 but it is certainly more pleasing to look at than the Captur I drove the other week. one that also serves as an object lesson in how not to do ergonomics. it’s a diesel, I don’t know what is under the bonnet. Probably a 1.6L. and the 2008 easily achieves 65mpg. to get in and out of, and I find myself about at the limit of headroom. on drivability, buy something like a Volkswagen Golf estate. Engine: 1.6L e-HDi diesel, 92bhp, 169lb.-ft. I confess to being predisposed to review a car more negatively simply because it is a crossover, which is a segment I just do not understand. Adding height and weight to an otherwise good car – in this case, the Renault Clio – does not make any sense to me, not least because it is guaranteed to reduce its drivability. So being handed the keys to the Captur this weekend was a bit of a disappointment (‘keys’ being a figurative term – the Captur has a card that locks and unlocks the vehicle based on your proximity, and operates with a start/stop button). I seem to hold a minority view, however, as crossovers sell by the boatload. But I suppose that if you’re in the market purely for practicality, the appeal of something like the Captur (and it’s sister car, the Nissan Juke), can make sense. Pitched as an ‘urban crossover’, you get small car underpinnings and efficiency with more usable interior space. It’s the sort of thing you would want to take kids to school and football practice and when you need to get some bigger things from IKEA, as it is a relatively comfortable and stylish way to get those tasks done. Indeed, Renault plays up the range of customisable options in its marketing scheme, offering a large array of colour combinations, both inside and out, to increase the chance that yours will be unique to the one down the road. Clearly Enterprise, who I hired the car from, wasn’t concerned about style, however, as this one was optioned with one of the worst exterior colours I’ve ever seen on a car, and a fairly plain charcoal-coloured interior. The cabin of the Captur is not an unpleasant place to be. Controls are well laid out, and the touchscreen infotainment unit is easy to use, though a bit laggy. Tachometer, speedometer, and fuel gauge are clear and easy to read, but could be positioned a bit better; if you’re over six feet tall, you will have a bit of trouble seeing them. Whilst the steering wheel is comfortable to hold on to and well-positioned, again, for a taller person, the gear stick feels a bit out of reach. The front seats are supportive and can be adjusted in a number of ways. For my height, however, I needed to put the seat all the way down to give myself enough headroom. Materials feel pretty good overall, and nothing rattles or sounds cheap when you’re bouncing around on bumpy roads. Kids will be comfortable in the back, although adults would be find it rather confining, especially if the front-seat passengers are tall. Keeping with its practical focus, one of the neat features of the Captur is removable seat covers, fastened with zippers. So if your toddler decides to deposit his lunch on the back seat, simply remove the cover, wash, and refasten it. There is a good amount of space in the boot, and folding down the rear seats would provide quite a bit of extra room for those bigger purchases, just like buyers of these sorts of vehicles are looking for. But if you care about driving, this is where the benefits of the Captur come to an end. Like most crossovers, it lacks any real feel – the steering is light and somewhat imprecise, the brakes are soft and don’t do much to inspire confidence, both clutch and gearbox feel mushy, and whilst the Captur delivers a relatively smooth ride on good surfaces, the soft suspension means you will be tossed around rather vigorously on rough roads, each bump sending you in new directions as the steering wheel jerks involuntarily in your hands. This is by all accounts one of the worst aspects of the Captur; stiffening the suspension up would go a long way in making the car more pleasant to drive. In a successful bid to make the driving experience even less enjoyable is the Captur’s lazy and pathetically underpowered 1.5L diesel, making 90bhp and 162lb.-ft. Although it is quiet and smooth at low rpm, and delivers in the neighbourhood of 60mpg, it is simply not up to the task of moving a vehicle of this size. Low-speed, 2nd gear starts are impossible unless you’re rolling downhill, twisty A- and B-roads require constant gear changes to keep the engine in its small powerband, and on a moderate incline on the motorway at 65mph, the car simply would not accelerate in high gear. Downshifting to 4th helps a bit, but the little engine protests loudly when asked to push beyond 3000rpm. Renault offers a 1.2L 120bhp petrol engine, which would certainly be the better option, but if they have any intention of making the Captur more pleasing to drive, it would need at least 20bhp more than that. When it’s all said and done, if you are in the market for practicality, the only reason I can think of that would entice someone to buy the Captur is its slightly quirky character. As it is, do yourself a favour and buy something like the Volkswagen Golf Estate instead, which will give you that extra practical space without sacrificing drivability. Engine: 1.5L dCi diesel, 90bhp, 162lb.-ft.
A year and a half ago, I got to drive the seventh-generation Volkswagen Golf for the first time (that particular car is actually featured in the header image for this blog). Prior to this, it had been one of the cars I most anticipated driving, both because I had driven and throughly enjoyed the previous generation Golf, and because of all the praise it was getting from automotive journalists. I loved it then, and now, after driving the seventh-generation Golf for the third time, I think I love it even more. 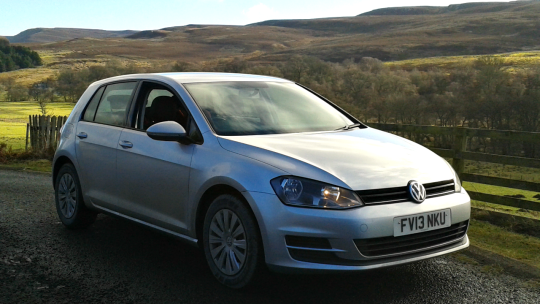 Though I have not driven a Golf with anything but VW’s 1.6L TDI, I am never disappointed when I do. At 105bhp and 184 lb-ft. of torque, it’s not a particularly powerful engine, but it’s sufficient. The torque resides in all the right places both for daily driving and for the twists and turns and ups and downs of the backroads. Unless you’re looking to blow the doors off other cars when the traffic lights turn green, you really don’t need much more, though you might want to choose the 2.0L TDI for a little more power. That being said, were VW to equip the 1.6 with a 6-speed gearbox instead of the increasingly old-fashioned 5-speed, the extra ratio might just do the trick (though you can almost forgive the 5-speed since it operates so nicely). To top it all off, over the 37,000 miles this car had covered, the dashboard computer was indicating it had averaged 65mpg, and it is hard to argue with that. The build quality of the Golf is superb all around. It really doesn’t matter how rough of a surface you’re driving over, the Golf remains stable, and you don’t hear any squeaks or rattles. The steering is precise, and though it could do with having a bit more weight, it has good feel. The brakes are good too, with good pedal feel, and stopping the car smoothly and confidently. What’s more, it handles every road well. On the motorway, it is smooth and stable, and on the B-roads of Northumberland with lots of ups and downs and sharp bends, it always remains composed and balanced. In short, it’s just a delight to drive. The only thing I might do different were I to buy my own is to opt for a slightly bigger set of wheels and tyres just to firm up the ride a little. Inside, the Golf is a very nice place to be. In typical VW fashion, there are quality materials all over, and the fit-and-finish is excellent. The car just feels solid all over. That kind of build quality means that it is also very quiet inside, even at speed on the motorway. Everything is very nicely laid out too, and the driving position is very comfortable. There is plenty of room both in front and in the back seat, and a good amount of storage in the boot. My wife and I have remarked before that for us with our two small children, the Golf would pretty much be the perfect size for us. When it’s all said and done, I still think the seventh-generation Golf is one of the best cars on the market, and certainly the best in its segment. And I can’t wait to drive it again. When you get to your local Enterprise location and are handed the keys to a vehicle that is essentially made by Volkswagen, it’s a good day. At least that’s what I mostly thought when I was given the keys to the Octavia. I say ‘mostly’, because I immediately anticipated one thing I wouldn’t like about the Octavia – that it was a big car with an undersized engine. It had that ‘base model’ appearance, which made me realise that this was going to have VW’s 1.6L TDI engine under the bonnet. Let’s start with the positives. Like most Volkswagen products, the Octavia’s interior is a delightful place to be. Everything is well made with good materials, and the cabin is aesthetically pleasing. And when you are sitting in the car, it just feels very solid. Not only that, but it is a lesson in ergonomics as well. All the controls are very nicely laid out and right where you need them to be. This model was equipped with some nicer features, such as DAB radio, built-in satellite navigation, and dual-zone climate control, all of which are intuitive and easy to use. It’s easy to relax too – the seats are comfortable, the driving position is comfortable, and it’s nice and quiet inside. As for room, there is plenty of it. It’s a big car, with lots of room everywhere, including the boot. It is certainly built to be comfortable car for long journeys. But that’s part of the problem. It’s a very comfortable car, which means it’s also a bit of a boring car. I know they make a sport version of the Octavia, but this wasn’t it. Equipped with the 1.6L 105bhp TDI, this big car is a slow car. Normally, I am a fan of Volkswagen’s little diesel, but in this car, the engine constantly feels laboured, and particularly when the car is full of people and luggage (as it was yesterday morning when I took my in-laws to the airport), it really struggles. It came with a 5-speed gearbox, but to really make this engine work, it would need the closer ratios a 6-speed gearbox provides, although that still wouldn’t be enough. Driving through the North Pennines yesterday required constant downshifting to keep the engine in the peak power band, or it would simply bog going uphill. The 1.6 returns very good fuel mileage, of course, but in this case, the lack of power and drivability isn’t worth the trade-off. There are a couple of 2.0L TDI’s in the Octavia lineup, starting at 140bhp, and they are certainly the better option for a car of this size. The Octavia handles well for its size. In the corners, it holds the road quite well thanks to a fairly stiff suspension, and you can carry speed into a corner with a degree of confidence. But there is a bit of a sense of detachment; you don’t really feel the road while you’re driving. Some people don’t mind this, but if you like a more dynamic driving experience, you might be disappointed. Related to this, the steering is nicely weighted, but again, could use more feel. Because of this, you generally find yourself understeering a bit in corners, and as a result, having to compensate a bit in the middle of the corner. The brakes lack feel as well, and because it’s a heavy car, requires a fair amount of effort to get the car stopped. To be sure, on the motorway, the car cruises quite nicely, even if the stiffer suspension makes the ride a little choppy at times. But overall, you just feel kind of disconnected from the car when you’re driving, I suppose if you only wanted to get on the motorway and set the cruise control, this car would do the job just fine. This, though, is just the base model, and it would be interesting to move a trim level or two and compare the handling. All that being said, the Octavia is in many ways a solid car, and it’s clear that with some better options, would be more enjoyable to drive. If you need a bit more space, and the solid reliability of a Volkswagen at a lower price, this might be the place to look. Just be sure to opt for a bigger engine and a slightly more dynamic suspension, because that would do a lot to make this car a really good car, and a pleasure to drive.